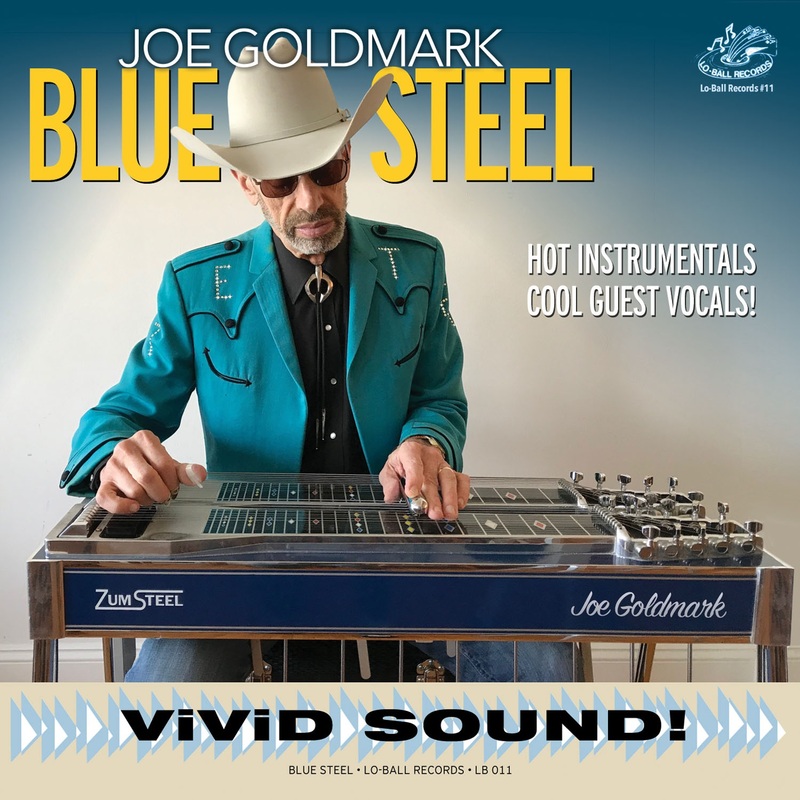 After seven solo albums of pedal-steel instrumentals (all of which include decidedly non-country covers), Joe Goldmark switched gears two albums ago by incorporating vocal numbers. His new tack began with 2007’s “Seducing the ’60s” (Goldmark’s second all-covers album — the first being 1997’s “Steelin’ the Beatles”), of which half the tracks variously feature guest vocals by two male singers and one female singer. “The Wham of That Steel Man!” was his 2012 follow-up, a two-CD multigenre exercise comprising an instrumental disc and a vocal disc made up entirely of tunes sung by a female singer. Now comes “Blue Steel,” another outstanding 50/50 instrumental-and-vocal set enlisting a male and a female singer, with one or the other contributing to the non-instrumental numbers. This time there’s an R&B/blues/soul theme, a unique approach for a pedal-steel album but not without precedence if the criterion were to be “any type of slide guitar”: Jeff Plankenhorn, who plays a custom-built electric dobro, released an all-soul album entitled “SoulSlide” in 2016. “Blue Steel” opens with a lively original instrumental, “Night Flight.” Recalling such rockin’ steelers as “Sneaky Pete” Kleinow and Red Rhodes, it’s highlighted by guitarist Gary Potterton’s (Tom Fogerty, Kate Wolf) succinct Duane Eddy-esque solo toward the end. The first of the vocal numbers is “All Night Worker,” a Rufus Thomas hit in 1964, here sourced from the 1966 version by Tex-Mex band Los Stardusters. Former Hoodoo Rhythm Devils singer Glenn Walters provides the voice. The Stardusters arrangement boasts a “She’s About a Mover” groove, which might not be a coincidence: Los Stardusters were on the Texas-based Tear Drop label, founded by Sir Douglas Quintet producer Huey P. Meaux. And so the album’s pattern is established, with the balance alternating between instrumental and vocal selections. The rest of the vocal tunes are also covers, a refreshingly eclectic collection of songs by Jimmy McCracklin (“The Wobble”), Graham Parker (“Howlin’ Wind”), Lefty Frizzell (“Look What Thoughts Will Do”), B.B. King (“Beautician Blues”) and Dallas Frazier (“True Love Travels on a Gravel Road”). The balance of the instrumentals are mostly Goldmark originals, with two exceptions: Bob Marley’s “Natty Dread” (sourced from eight-string jazz guitarist Charlie Hunter’s 1997 instrumental reimagining of Marley’s 1974 album of the same name) and “I Want to Be With You Forever” (written especially for “Blue Steel” by Bay Area guitarist and Goldmark colleague Jim Campilongo, who also plays guitars on the track).